Cut the bottoms of the asparagus off and cut the stalks into thirds. Slice yellow squash into thin circles. Steam (put steamer basket over 1 inch of water in a pot, put veggies inside the basket, sprinkle with garlic powder, and cover with the pot lid) the asparagus, mushrooms, and squash, sprinkled with garlic powder for about 5 minutes. While waiting for the veggies to steam, put the remaining ingredients (except the cheese) into a large pot (wait until veggies are done to put the large pot on the stove). When veggies are done, add them to the large pot and cook soup until pasta is done (with lid on). Taste the broth to make sure there is enough salt and enjoy! I shred some Asiago cheese on top with a microplane! Delicious. 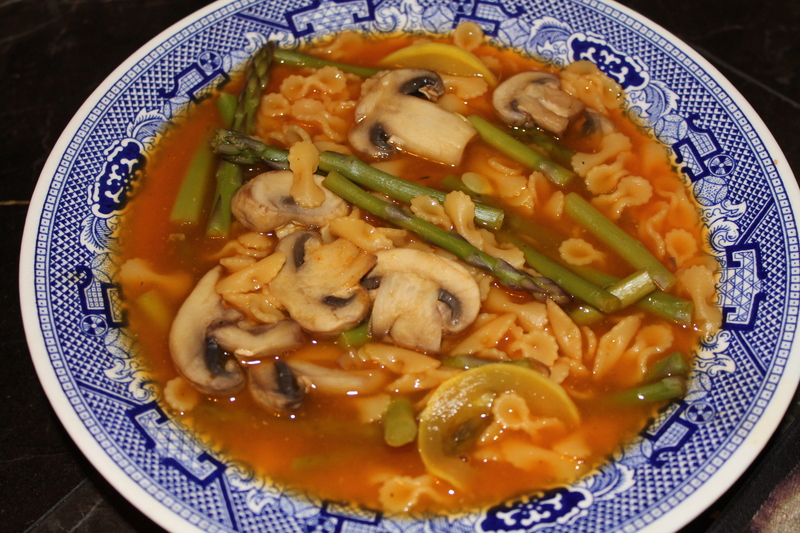 This soup is so healthy and it’s vegan if you hold the cheese at the end! The mushrooms in this soup provide an excellent source of potassium, even more than bananas, and have antioxidant qualities!! The asparagus is rich in folic acid, keeping your cells healthy!! **Hongo is spanish for “mushroom” and since this is an original recipe I thought I would give it an original name. The addition of the spanish seasoning gave me the inspiration for the name!